Durable and waterproof. Versatile mat for crates, car or home. 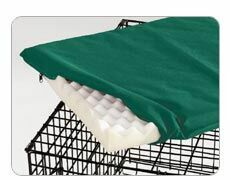 Made of waterproof hydrotuff nylon, these crate beds are fit most wire crate sizes. Zippered cover and High Density foam insert. Comfortable and easy to clean. Cleaning Directions: Remove cover then re-zip outer cover and machine wash and dry on cool setting. Do not wash foam insert, spot clean only.